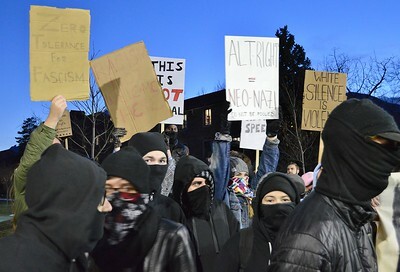 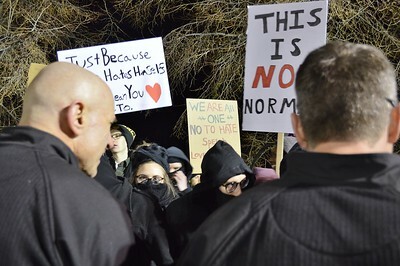 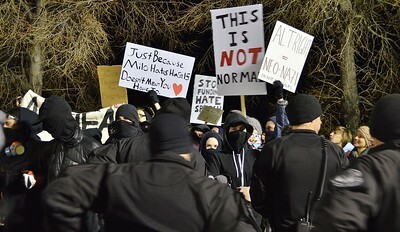 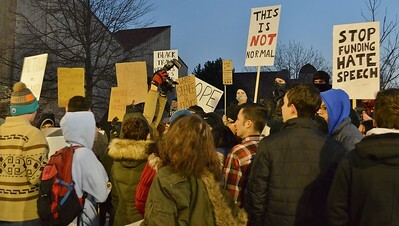 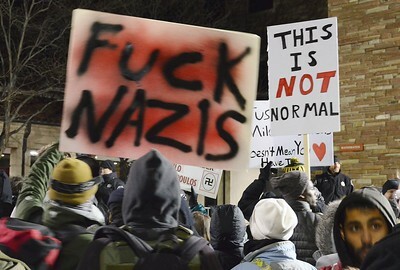 About 300 people, including masked Anarchists, protested a speech by alt-right proponent Milo Yiannopoulos at the University of Colorado in Boulder. 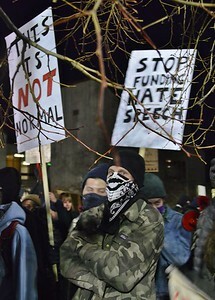 Man wearing mask and camouflage jacket at protest aginst speech by Milo Yiannopoulos at Univ of Colorado in Boulder. Protesters with signs at speech by Milo Yiannopoulos at Univ of Colorado in Boulder. 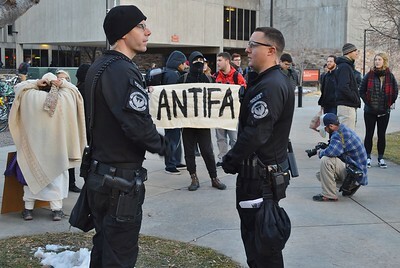 Anarchist protesters in black talking to a police officer at Milo Yiannopoulos speech at Univ of Colorado in Boulder. 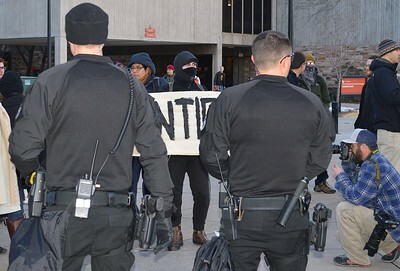 Police officers and protesters at Milo Yiannopoulos speech at University of Colorado in Boulder. 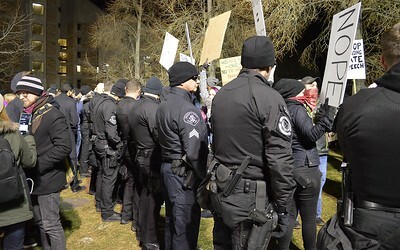 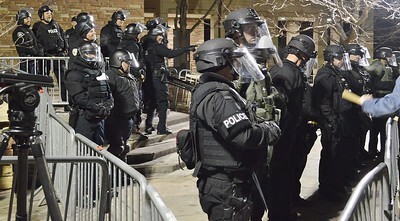 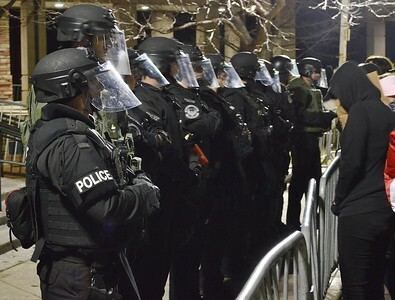 Police and protesters face off at speech by Milo Yiannopoulos at Univ of Colorado in Boulder. 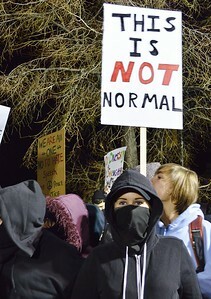 Masked protester at speech by Milo Yiannopoulos at Univ of Colorado in Boulder. 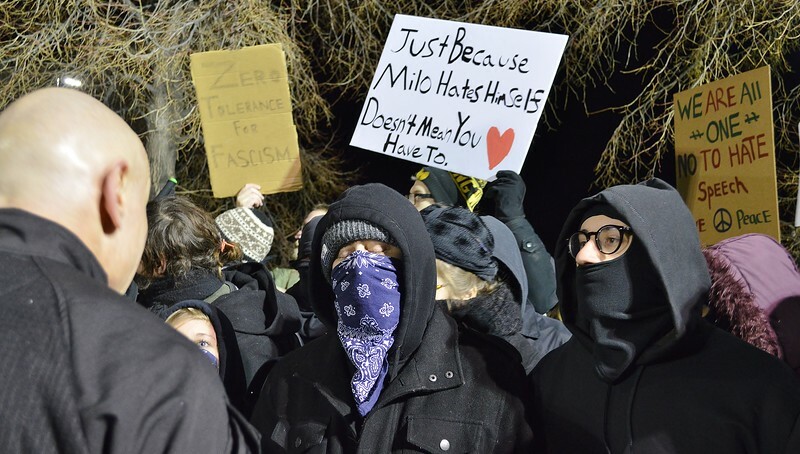 Three women hold anti-Nazi signs at protest against Milo Yiannopoulos speech in Boulder at the Univ of Colorado. 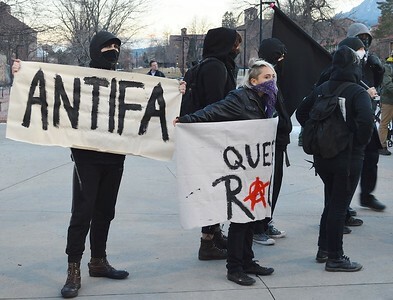 Anarchist protesters in black, holding 'ANTIFA" banner at Milo Yiannopoulos speech at Univ of Colorado in Boulder. 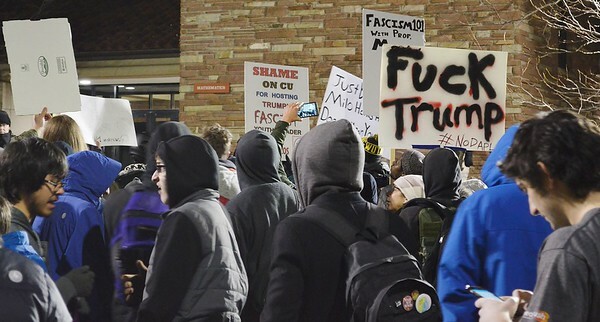 Protester with anti Donald Trump sign at speech by Milo Yiannopoulos at Univ of Colorado in Boulder. 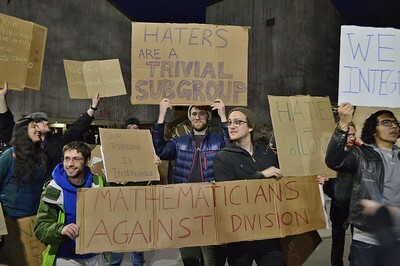 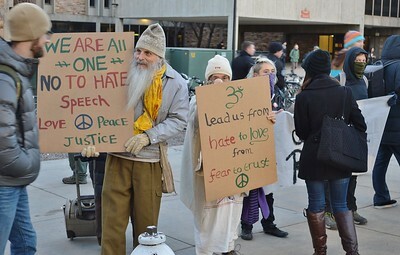 Mathematicians hold up signs at Univ. 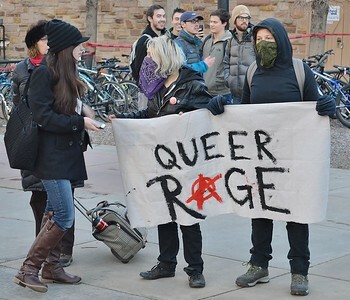 of Colorado-Boulder speech by Milo Yiannopoulos. 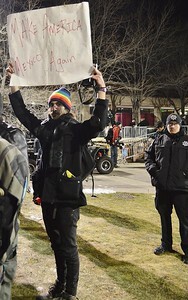 Protester holds up sign about US & Mexico at speech by Milo Yiannopoulos at the Univ of Colorado in Boulder. 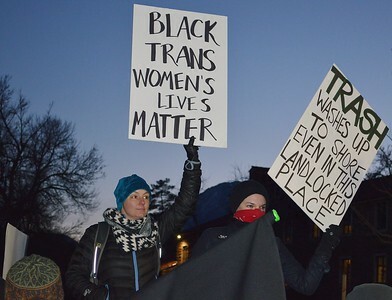 Woman holds up "Blacks Lives Matter" sign at protest against a speech by Milo Yiannopoulos at Univ of Colorado in Boulder. 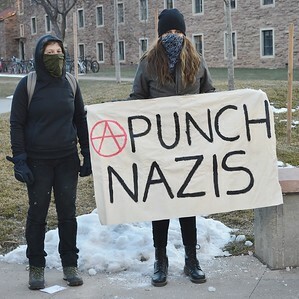 Young woman holding "Punch Nazis" sign at protest against Milo Yiannopoulos speech at Univ of Colorado in Boulder. 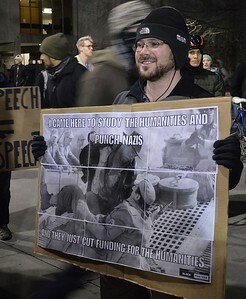 Man at protest against speech at Univ of Colorado in Boulder by Milo Yiannopoulos, holds picture of "Indiana Jones" punching a Nazi. 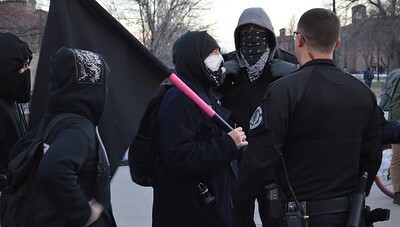 Police and protesters wearing mask face off at speech by Milo Yiannopoulos at Univ of Colorado in Boulder. 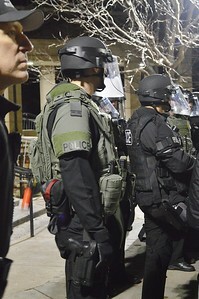 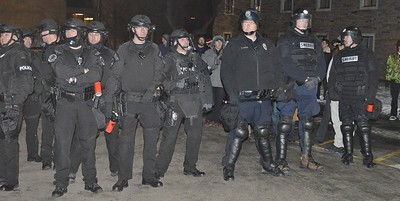 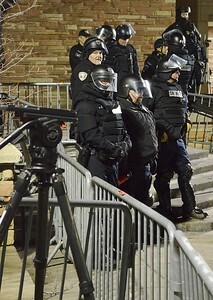 Police in riot gear at protest against Milo Yiannopoulos speech at University of Colorado in Boulder. 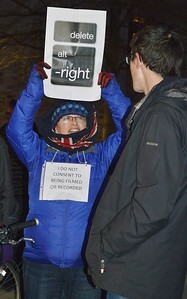 Woman holds up anti "alt-right" sign at protest of speech by Milo Yiannopoulos at Univ of Colorado in Boulder. 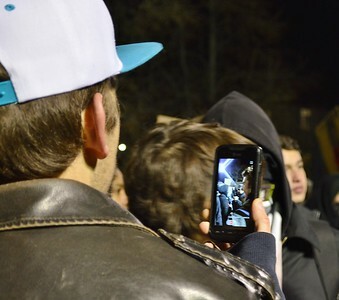 Protester takes pictures with cellphone at speech by Milo Yiannopoulos at Univ of Colorado in Boulder. 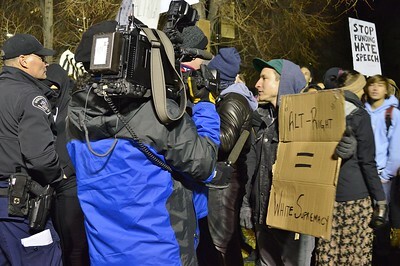 Anti Milo Yiannopoulos protester being interviewed by a TV news reporter at speech by Milo Yiannopoulos on the Univ of Colorado campus in Boulder. 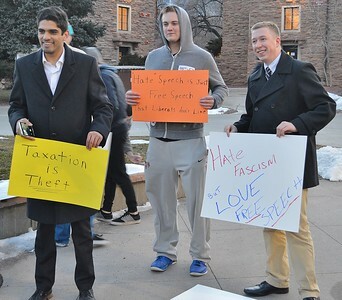 Protesters with with signs at Milo Yiannopoulos speech at Univ of Colorado in Boulder. 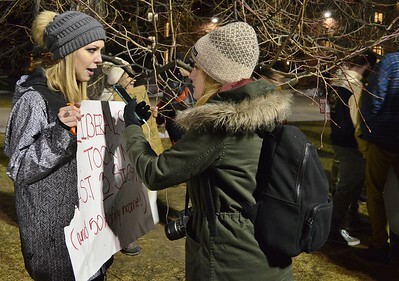 Milo Yiannopoulos supporter being interviewd by a reporter at Univ of Colorado-Boulder protest. 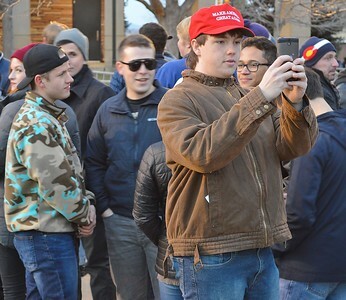 Donald Trump supporter takes cellphone pictures of protesters at Milo Yiannopoulos speech at Univ of Colorado in Boulder. 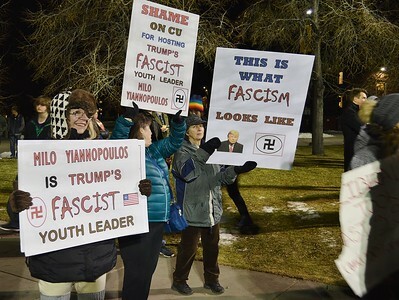 Donald Trump supporters holding signs at Milo Yiannopoulos speech at Univ of Colorado in Boulder. 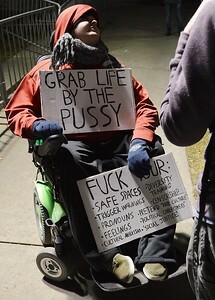 Man in wheelchair holds anti-liberal signs at protest against Milo Yiannopoulos speech in Boulder at the Univ of Colorado.